This cozy soup is perfect for those early spring days that still feel like winter. 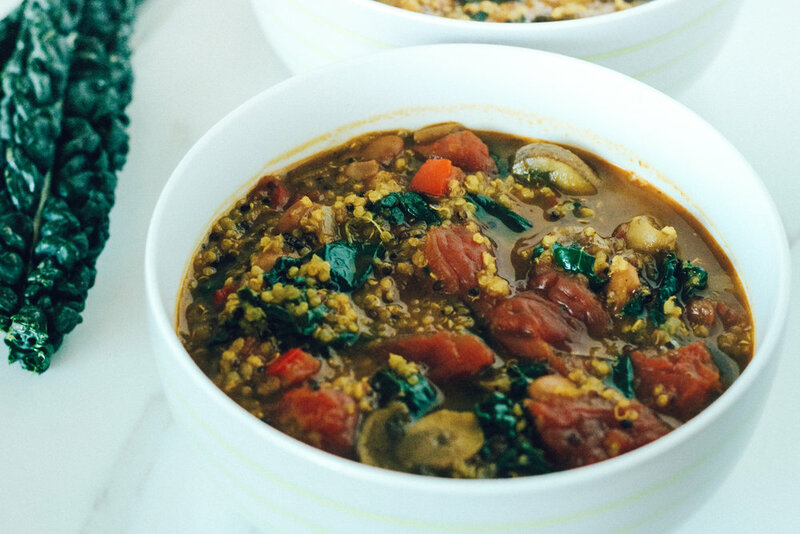 Rich in antioxidants, vitamins, and minerals, this soup will get you through a hectic week! Ingredients like turmeric and kale provide tons of antioxidants which have powerful anti-inflammatory effects. In a large pot, heat olive oil over moderate heat. Add diced onion, red pepper, garlic, and mushrooms, and sauté for about 5-7 minutes, or until onions are translucent and aromatic. Add the chili powder, cumin, coriander, oregano, and turmeric, and sauté for another 2 minutes. Add the vegetable broth and tomatoes. Season with salt and pepper to taste, and bring the mixture to a boil. Reduce the heat to medium-low and let the soup simmer, uncovered, for about 20 minutes. Add the dry quinoa and cover; cook for 15 to 20 minutes, or until quinoa is cooked. Finally, add the cannellini beans and the kale. Simmer for another 5 minutes, stir in the fresh lemon juice, and enjoy!